Our heart doctors and engineers are working together to save lives by creating 3D printed aortas. 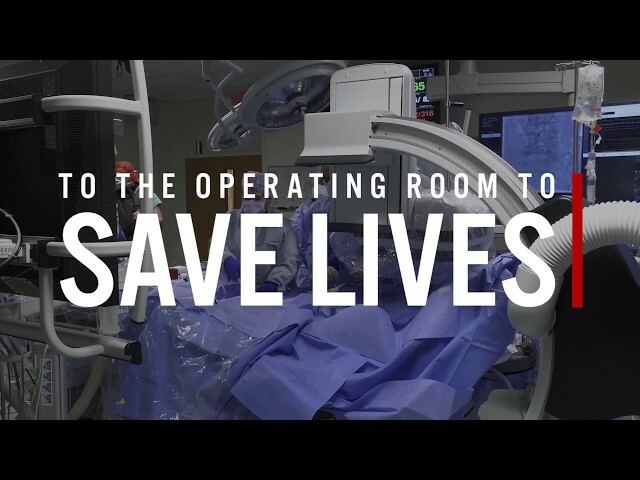 Doctors and engineers working together to save lives might sound unusual, but at The Ohio State University Wexner Medical Center, we'll do whatever it takes to stay at the forefront of medicine. We are now working with our College of Engineering to adapt 3D printing to medicine. Before performing a complicated aortic valve replacement, cardiologists like Dr. Scott Lilly partner with engineers to make 3D printed aortas and computer models that exactly match the patient's anatomy. "We connect it to a simulator to replicate what happens in the left ventricle of the patient's heart," says Prasad Dasi, a biomedical engineer at The Ohio State University College of Engineering. "We pump a blood-like substance through the simulator, controlling the contraction, expansion and pressure to match the patient's conditions." Using lasers and a high-speed camera on the model, Dasi and his team can see things that can't be observed by physicians on medical scans or during the valve replacement procedure. They can test and observe which type of valve and specific placement work best, with the least chance for complications such as leakage, clotting or obstruction. They meet with the physicians to decide together what's best for the patient. "The ability to predict which valve will fit most effectively, have the least amount of leak and not impinge upon adjacent structures is critical," says Lilly. "These 3D models and discussions directly inform how we approach many valve replacement procedures for our patients." Discover how our Center for Brain and Spinal Cord Repair is leading the way in research that helps people regain abilities and improve quality of life. See how we're innovating to create a world without diabetes. The engineering research team also creates computer models to capture the data from each simulation. Long-term, they want to understand each patient's anatomy and blood flow without the 3D printed model to speed personalized treatment decisions. Right now there are few options for artificial aortic valves. Mechanical valves are used in open heart surgery, but require patients to take blood thinners for life. Valves that are deployed through a small catheter have leaflets made from cow or pig tissue, but they don't last as long. So Dasi's lab is hard at work creating a better replacement heart valve with engineered material enhanced with biomolecules. That could make future transcatheter heart valves more durable and more blood compatible, potentially eliminating the need for blood thinners for these patients. Through this unique collaboration, Ohio State physicians and research engineers are at the forefront of a new era in heart valve replacement.